They should be planted in good draining ground, especially important if they are to overwinter well. Improve clay soils with grit and lots of well rotted organic matter. They are perennials so come up year after year. They are deciduous, loosing all their leaves and stems in winter. This species (often called Italian asters) has been cultivated in Europe for more than 2,000 years. It's natural habitat is limestone soil which is free draining and it prefers full sun but will grow fine in partial shade if it is only in the morning. The most well known varieties include 'King George' and 'Veilchenkonigin' which has mauve flowers, 'Rudolph Goethe' and 'Violet Queen' have violet flowers and 'Sonia' has pinkish flowers. All have yellow centres. 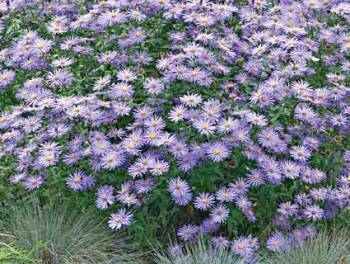 All varieties of Aster amellus make excellent cut flowers which last about a week. The flowers appear in August and continue into September / October. They prefer an alkaline to neutral soil which is well drained. One particular frikartii variety, Monch, is probably the best known of these asters. Our advice would be to choose this variety. They are suited to most soil types as long as drainage is good. Click here to buy Aster frikartii Monch online from our recommended suppliers. 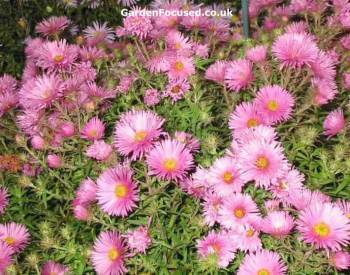 Also known as New England asters, these are a far better choice than their look alikes the Michaelmas Daisy. This species is the one with flowers which close at night although the modern varieties tend not to do this. The most well known varieties of Aster novae-angliae include 'Violetta' with violet purple flowers, 'Purple Dome' (shorter than most at 55cm high), 'Barr's Pink' an old variety with rose pink flowers, 'Harringtons Pink' also pink flowered. Any of these can be bought online at our recommended supplier, Crocus, by clicking here. The lower leaves tend die off early leaving slightly unattractive stalks so some foreground planting will mask this. 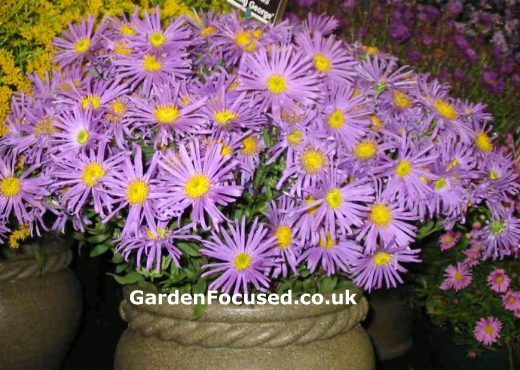 This is not so much a species of aster rather it's a mish-mash of hybrids in all sizes and colours. You need to accept that with this group of asters mildew will almost certainly be a problem and spraying will be required on a regular basis. This is one reason they are not suited to the very amateur gardener. GROW ASTERS FROM SEED OR PLANTS? Although aster seeds are sold in the UK they are for annual plants not the perennials discussed above. So initially your only choice is buy these as pot grown plants. Having established an aster plant, taking a cutting is simplicity itself. Forget the complication of cuttings, simply look at the base of the plant and select a suitable side shoot. Gently tease it out and either plant in pots or directly in the ground. The best time is in late spring. Another easy alternative is to dig up an established clump (three years old or more) and use a spade to cut the clump into into four. Replant wherever you want them to grow. This second method should be used anyway when the plants get to be five years old to reduce congestion. 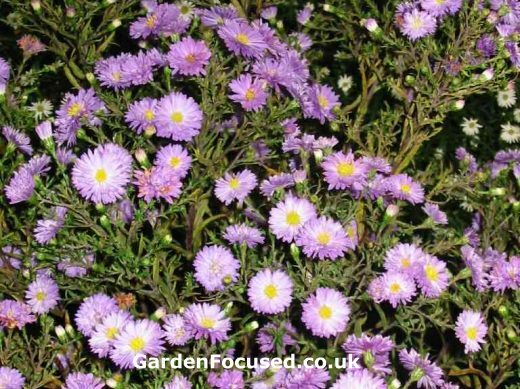 Under normal conditions asters do not require watering, in fact too much water opens all of them up to mildew infections. In drought conditions a thorough soaking with water should see them through two weeks of dry and hot weather. A twice yearly application of a long-lasting fertiliser such as blood, fish and bone will help improve the flower colour although this is not essential. A handful of fertiliser scattered around each plant and gently worked into the surface of the ground will be fine. To get the longest flowering period from your asters, cut off the flower heads when they have died down. This will definitely extend the flowering season and keep the plants looking at their best the flowering season. It is closed at other times of the year. The best time to visit is around the end of September. Old Court Nurseries are on the same grounds as the aster collection and you will have a chance to buy many of the plants grown there. There is a charge for entry at £3.50 per adult although free to children up to 18 years of age. Admission is free to RHS members. For some peculiar reason though, RHS members in coach trips are charged the normal entrance fee! Work out the reason for that! Other shrubs in this series include Ceanothus, Choisya, Hebe, Skimmia, Magnolia, Mahonia, Mock Orange, Lilacs, Potentilla and Rose of Sharon (hibiscus syriacus). Our main shrub index page can be seen by clicking on the link below. Below we list the key strengths and weaknesses of Asters. FLOWER TIME July to end Sept.